How many Brits like their jobs and their wages? August 03, 2017, 1:03 p.m. Recently, YouGov put a dilemma to the public: would you rather have a job you hate that pays well, or a job you love that pays poorly? The public overwhelmingly plumped for passion over pay, with approaching two thirds (64%) saying they’d rather have a poorly paid job they loved compared to just 18% who’d prefer a well-paid job they hated. But what proportion of British workers actually fall into these two categories? And how many Brits have hit the jackpot of having a job they think is well paid and which they love? To find out, YouGov Omnibus has asked 1,133 British workers how much they like or dislike their jobs and compared this against how well or poorly-paid they consider their jobs to be. How much do Britons like their jobs? Given that we spend so much of our life earning a living, it is good to see that the majority of British workers feel positively about their employment. Close to half (45%) say that they like their job, while a lucky 17% have found jobs that they love. A further one in five (20%) neither like nor dislike their job. Relatively few are in employment they don&apos;t like. One in ten British workers (10%) say they dislike their jobs, while 6% say they are in jobs they actively hate. Middle class employees are noticeably more likely to like their job than working class ones. While two thirds (67%) of people in the ABC1 social grades say that they either like or love their jobs, this falls to 55% among those in the C2DE category. Similarly, women were more likely than men to say they like/love their jobs (68% vs 58%). How well-paid do Britons think their jobs are? Nearing half (47%) of British workers seem satisfied with their level of pay, with four in ten (39%) believing they are fairly well paid and 8% thinking they are very well paid. 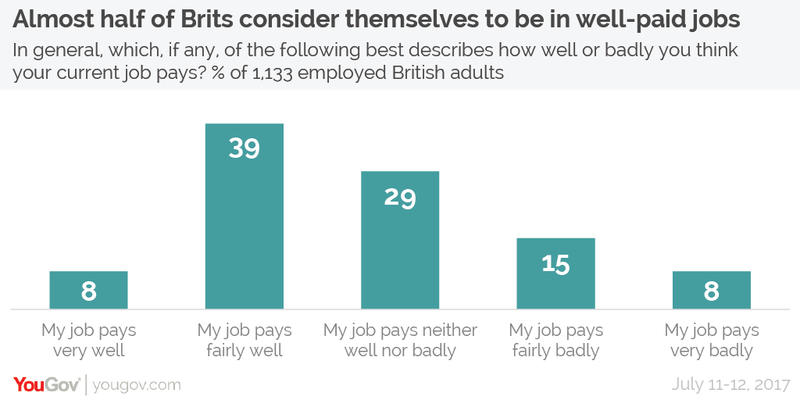 Just under a quarter of Brits consider themselves to be in jobs that pay fairly (15%) or very (8%) badly, while about three in ten (29%) think they are paid neither well nor badly. Those in the middle classes are more likely to feel their jobs are well paid than working class people (52% vs 36%). While men are less likely to say they enjoy their jobs than women, they are more likely to think they are paid well. Half (50%) of men say that their job pays very or fairly well, compared to 43% of women. Overall, a fortunate third (33%) of Brits are in fairly/very well paid jobs they like or love, including one in five (20%) that are in jobs they like consider to be fairly well paid and the 2% thathave very well paid jobs that they love. On the other end of the scale, one in twenty (5%) are in fairly/very badly paid jobs they dislike or hate - with an unfortunate 1% being in what they consider to be a “very badly paid” job that they hate. As for the original conundrum YouGov posed, it turns out only 5% of Brits find themselves in one of the two scenarios: 3% are in poorly paid jobs the love, while 2% are in well paid jobs they hate.